Two Sumarian's, Enlil and Enki were sent to Earth to oversee the mission of mining gold. Enlil and Enki were the son's of Anu, translated "supreme Lord of the Sky". Enki had been the first of the Anunnaki to make the trip to Earth. When Enki failed to produce a sufficient amount of gold, Enlil was sent in to take over. This fueled an already existing conflict between the brothers. The mining was relocated from Mesopotamia to South Africa (Ab-zu). After some time the Anunnaki appointed to work the mines mutanied. It was at this time that Enki had the idea of creating a primitave worker. “Let us make man in our image, after our likeness.” Enki was then granted permission to create a slave race for the Anunnaki. Enki's first creation "Adam" could not procreate on its own. Enki then created "Eve" without Enlil's knowledge. Enlil created an E.DIN, a special place where new strains of edible crops could be developed and later implemented. The slaves were placed in E.Din aiding in the efforts to raise food. Enki encouraged them there to eat the fruit from the "Tree of Goog and Evil" (e.g. sexual knowlege) (note: “snake” is nahash, which comes from the root word NHSH, and which means “to decipher, to find out.” In other words, Enki, the God of Wisdom) When Enlil learned of this he banished the humans from E.Din. Enki looked after the slaves. Throughout the rest of the time the Anunnaki spent on Earth Enki and Enlil were at odds over the situation of the humans. Enlil and Enki continued in many fueds listed in the Bible. Humans also chose sides during this time. Noah, who remained on Enki's side was furnished with plans for a boat when Enlil created the great flood. In circa 2000 B.C.E. there was a war between Enki’s humans and Enlil’s humans. This lead to the destuction of Sodom and Gomorrah with nuclear weapons. The decision for this, however, was not, as you might have expected, due to Enlil’s instigation. Instead, it was due to the actions of his sons, Ninurta and Ningal. Beacause of this Enlil was no longer recognized as the Lord of the Command by his peers. The fallout of their actions resulted in the final destruction of the Sumerian civilization. In the end Enki was able to preserve his creation on Earth. this sounds interesting. But where exactly can i find the sumerian text that actually says these things; for example mentions Adam and Eve. 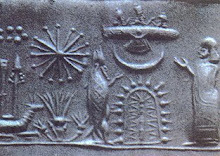 Do you believe the Anunnaki are real?